Well I am finally posting a hodge-podge of pics from the summer. It amazes me how much Ainsley has changed these last few months! We have had so much fun with her. Never did I more fully understand what people mean when they say that children are sponges. She just picks up on everything and learns so fast! Here are some of the things that she has learned and just some of the things that she most enjoys for those of you who don't get to see her very often. 1. This summer we went cold turkey off the bottle. In July she started drinking whole milk out of a sippy cup. We heard it could be a rough transition but she adapted very easily. We just felt a little bad because she had literally just started saying "Bot" for bottle and then we took it away! One thing we noticed was that after we took the bottle away she became much more attached to her pacifier and her lovey security blanket. 2. 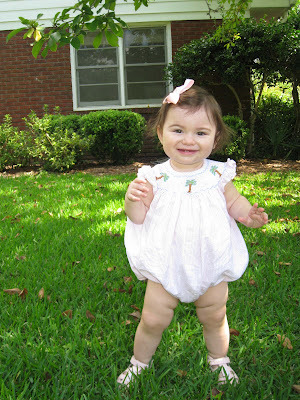 She stopped eating baby food and started only eating solid foods. At first she would only eat bananas. Nana is her word for it and it was one of the first words she learned! Then she started being better about eating more fruit and some bread but refused to eat vegetables, so we had to put her on vitamins. Now she is not as picky as before but she still only eats a few veggies -lima beans are her favorite and pretty much the only other veggie she'll eat is peas and that is only on occassion. She does not eat much meat, either. She'll eat any type of fruit and she loves grilled cheese sandwiches and macaroni and cheese. We are able to sneak lunch meat in her grilled cheese to get her to eat some meat, and sometimes she'll eat fish sticks or chicken nuggets. 3. She started walking at the end of June and now she practically runs everywhere! 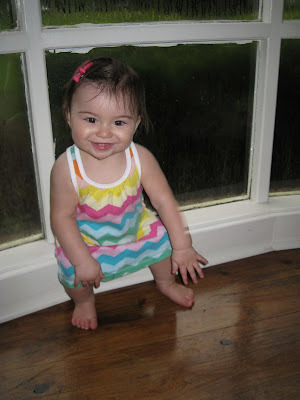 She took her first steps when she saw an 11x14 photo of herself that I framed large and hung over our piano. She saw it and said "Baby!" and took about 4 steps towards it! Then for a few weeks the first thing she would do every morning was go into the living room and look at herself and smile and say "Baby!" 4. 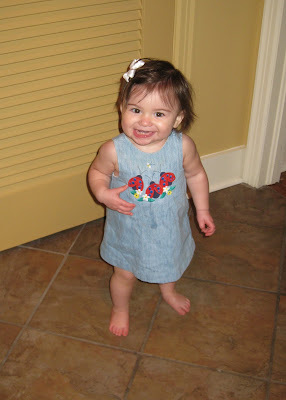 Even before she learned to walk, she learned that she could push things around. She spent most of the spring and summer pushing her toys and light pieces of furniture around the house! 5. She FINALLY got over her fear of walking on surfaces that she's not familiar with. 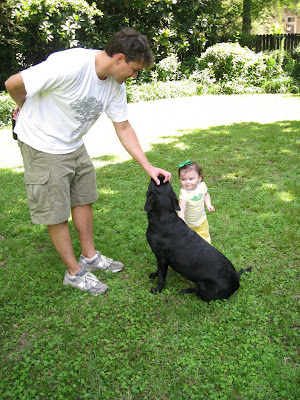 Even with shoes on she spent most of the summer crying if we tried to put her down in the grass outside. In August she finally got over that and now she wants to be outside all the time. 6. She's learned lots of words. Her first word was Mama back in April, then Dada in May. Then she started saying uh-oh, nana, bu-bye, baby...now she says all kinds of words like nite nite, pati (for pacifier), munny for Mickey Mouse, bok for block, ball, boat, and lots more. Her most southern word is dog - she really drawls it out and says "Dawwwg." It's so cute! Her most recent word is football! She started saying that pretty well this weekend, thanks to her daddy helping her. 7. Some of her latest achievements are that when I ask her where her nose is she puts her finger on her nose and says "Nose." She can stack 3 or 4 blocks before knocking them down. 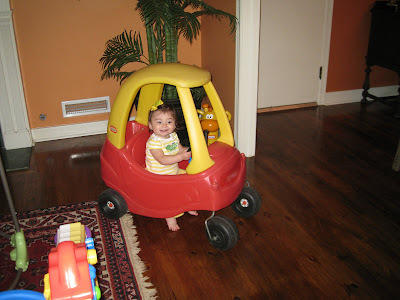 She has gotten much better at climbing - her latest thing is climbing in and out of her cozy coupe car. She just started giving kisses and this weekend started blowing kisses, too. She loves spinning around in circles. Back in July she discovered hide and seek and has her special hiding spot behind the door to the kitchen where she runs and hides until we say "Where's Ainsley?" She also loves being chased around the house or outside. 8. She absolutely loves books and wants us to read to her all the time, which of course we love to do! She loves to put her smaller toys inside of bigger toys and then dump them out and do it again. 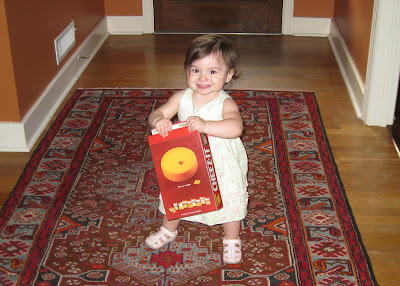 She also loves music. I sing to her a lot and many times she tries to sing along with me. And she loves dancing. There is one spot in our kitchen that she loves to go to and dance for some reason. 9. At daycare, she has moved up to the one year old class and is in there with 10 other 1 year olds. She gets to go outside a lot more, which I know she loves. They had an Open House at the school this week where we got to talk to the teachers and they said that she is prissy and doesn't like to get stuff on her hands. They gave us a piece of her artwork where they glued cotton balls to a picture and they said she did not like getting the glue on her fingers. They also said she is bossy and "Has to get what she wants," even if that means taking toys from the other kids! Uh oh! But I asked if that was normal and they said yes, that all the kids are like that at this age. So that made me feel better. Guess she might be a little spoiled - oops! 10. She has learned how to say "No" and she also knows how to use it! She says it so funny that we can't help but laugh. She says it very prissy-like. I'm sure we will not be laughing about it for long, though. She says no when she doesn't want to eat or drink or do something. She has also started ignoring us sometimes when we tell her No, like it's a game! That or she will just blatantly do what we don't want her to do because she thinks it's funny. The best example is throwing her cup off of her tray at meals. She will grab the handle of her sippy cup and literally dangle it over the edge of her high chair tray. I will give her a stern "No, do not drop it on the floor, put it on your tray. No Ainsley, no." And she will look me right in the eye, give me a little half-grin and then let go and drop the cup! Aside from all of her physical and mental changes, she really is just the sweetest little girl. I truly had no idea that I could love anything or anyone this much. It brings tears to my eyes sometimes. I just feel so blessed to have found such a wonderful husband and to have a family with him. Ainsley is such a joy. 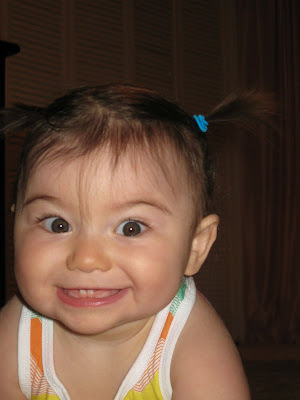 She is happy most of the time and loves to laugh and play. She has the sweetest smile and the best laugh. And at bedtime or naptime when she sits in my lap and lays her head on my chest while I sing to her or read her a book I feel like life just cannot get any better. Well here are some pictures! Taken in June, this was our first attempt at pigtails! 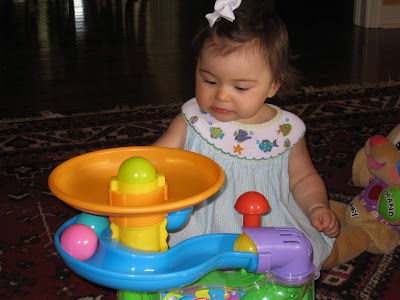 Playing with her ride-on toy car in June. Playing with her ball-popper that Miller Calhoun gave her for her birthday. Taken in June. 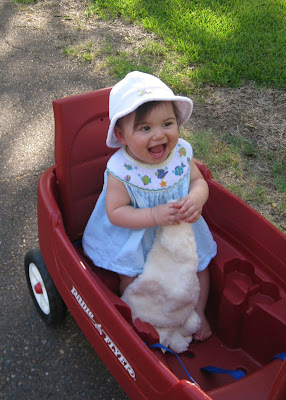 Taking a ride in her wagon, which she also got for her birthday. She loves her wagon! Sitting on the window sill of our big bay window in the front of our house. She went through a phase where this was her favorite little spot. She would try to sit on it by backing up and plopping down, often landing on the floor, until she got to the window sill to sit. Taken in July. We got to go to the nearby park several times this summer. 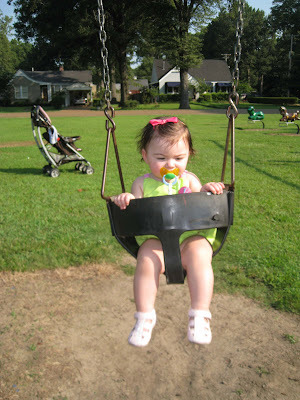 Ainsley loves to swing! Taken in August. 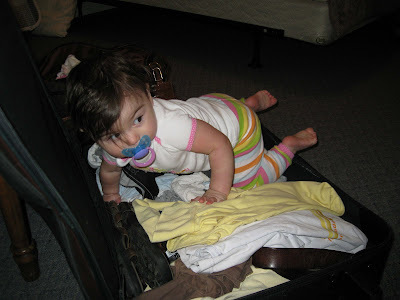 We went to Moon Lake for family lake weekend with Moss' family and Ainsley decided she would climb into daddy's suitcase. She also loves climbing into laundry baskets and has recently tried climbing into her toy chest/ottoman and tried climbing in the big cooler that was full of ice and drinks last night. Obviously we did not let her climb into the toy chest or the cooler. 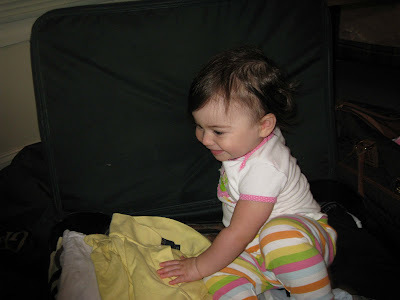 But she sure enjoyed daddy's suitcase! 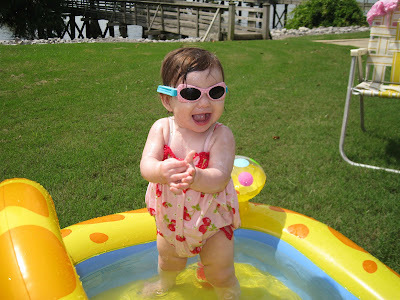 We also spent lots of time in her kiddy pool this summer. Below was at Moon Lake in August and is one of the few pictures I have of her with her sunglasses on. 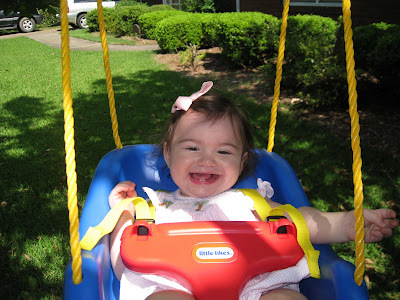 As I said before, Ainsley loves to swing, so her Aunt Blewett got her a swing for her birthday. Moss hung it from the tree in our front yard and we have spent lots of time there this summer. 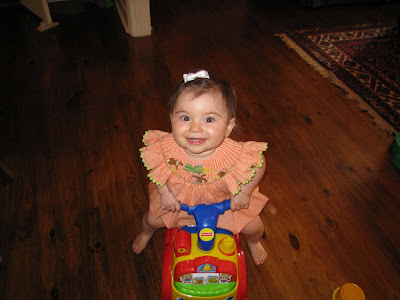 For awhile we could not enter our house through the front door, we had to go in through the garage, or she would have a complete screaming fit because she would see her swing and want in it. 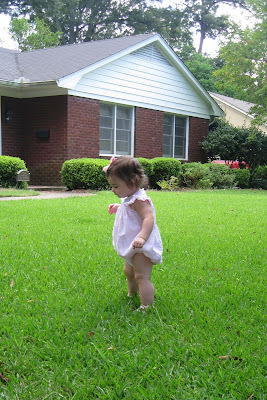 Taken in August, Ainsley finally likes being outside and walking around in the grass! Ainsley loves Scout. 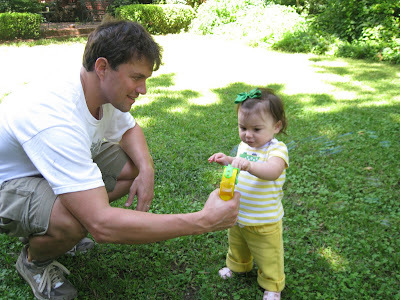 Here she is playing with her and daddy in the backyard. 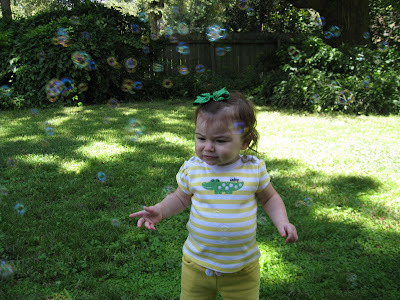 We had fun with bubbles outside this summer, too. These pics were also taken in August. 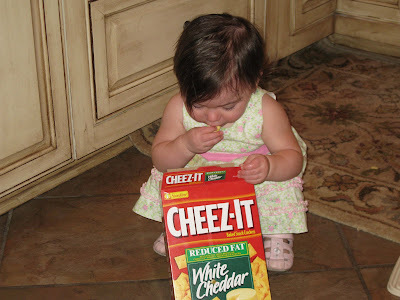 Ainsley discovered Cheez-Its this summer. Here she is wolfing some down in the kitchen. Taken at the end of August. Ainsley in her dancing spot in the kitchen just having a good time! Take in September. Riding around in her cozy coupe. She's finally big enough to use her feet to move it around the house. She hasn't mastered going forward, though, and can only go backwards! She also likes to get out of the car and push it around the house. I think we're going to need to re-paint before we ever sell our house because she always ends up hittting the walls. Oh well!